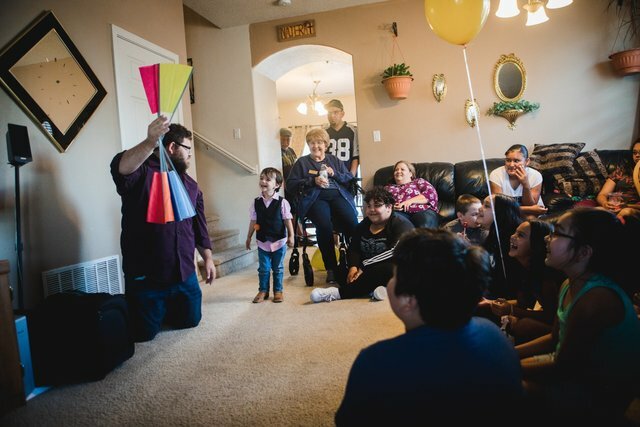 William's magic show is 30-45 minutes of fun, imagination, and postivity. Is your kid the one who begs for magic kits and watches Youtube videos about magic constantly? Or are they the fun-loving one who is easily WOW'd and magic would add that extra special touch to their day? This is the show for you! One of the very best ways to add something special to a party is to add a comedic, fun, entertaining, and interactive magician to their day! When the magic is personalized and placed right into a child's own hands and happens right before their very own eyes, nothing compares. William's show is performed with a lighthearted and funny approach while producing exciting illusions right before their eyes, involving them in the process. Nothing on fire or sharp or dangerous ever occurs in William's shows. He performs what is commonly referred to a "suitcase act", meaning it could fit in a suitcase (and it's quite literal in this case)! Interactive, shocking, and truly FUN entertainment is the goal!